“Timor Goksel, the former spokesman of the U.N. peacekeepers in Lebanon. defended the observer mission in Syria. He said it will take time for the team to deploy and get acclimated, but that it would ultimately have a positive effect on the situation. Goksel said that extra time is needed to get the full observer team on the ground, since the Syrian government insists on approving what nations will participate. Analyst Nadim Shehadi of Chatham House inLondon, however, said that time is of the essence in deploying the U.N. observer team. We, the residents of the city of Zabadany, draw your attention to the fact that the international delegation of UN observers visited the city yesterday, Monday, April 23, and met with opposition activists. The meeting lasted 10 minutes. Upon their arrival, only three of the monitors emerged from the UN vehicle: the head of the mission, an Indian; a Brazilian monitor; and a third, a Moroccan, Col. Ahmad Hamishi. The rest of the observers remained in the vehicle. When we requested that Col. Hamishi receive the lists of detainees, some of whom had been detained for 8 months, and lists of local martyrs and their causes of death, he refused, explaining that it was not part of his mission. After that, we asked him to take possession of our activists’ Google Earth satellite images of the map of Zabadany. The images show clearly where heavy military equipment is stationed in the city, and where tanks and artillery equipment are deployed; this equipment has a range of approximately 45 kilometers. Col. Hamishi refused to accept the images, providing no reason for his refusal. When we informed him that we had risked our lives to meet him, and were ready to accompany him so that he could see with his own eyes the widespread military checkpoints, he refused, saying he did not have the time. As he walked to his car to leave, after fewer than 10 minutes with us, one of our activists pointed to a house in which a wall had been destroyed during Assad forces’ bombing. Col. Hamishi informed us that he did not believe that the damage was the effect of shelling, and that his position was justified by the fact that the house had not completely burned down. When the mother of a missing person approached to request that he return her son, he refused to listen to her, and informed her that he did not know Arabic. After that, the UN observers’ delegation met with a regime delegation made up of Intelligence agents and shabiha. 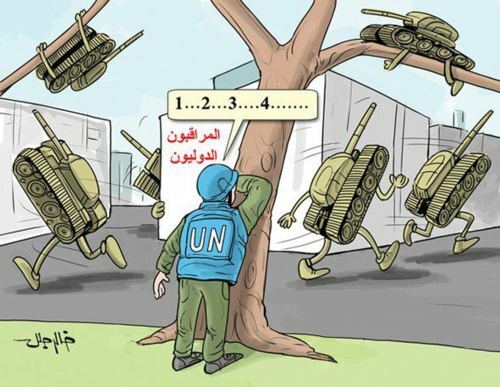 The regime representatives informed the UN observers that there was no military or tank deployment in the city – even though they would have had to pass through checkpoints to reach the area where the opposition activists were gathered. But killed they are. Sometimes watched by these observers. “Russia accused the Syrian rebels on Thursday of waging a wide-scale terror campaign that is designed to kill as many civilians as possible despite a formal ceasefire. So the civilian population is apparently shelling themselves with the Russian 240 mm mortar bombs to destroy their own houses and apartments. And killing themselves so they can put themselves in mass graves. Yeap that sounds like a very plausible theory doesn’t it? I was going to write about EU’s part but what’s the point? On Monday April 23, EU imposed the 14th round of sanctions. I mean come on! 14 in little over one year -That’s one every 24 day. It’s becoming ridiculous. This is NOT serious. It’s just cynical and hypocritical. This is the EU that according to the official rhetoric was set up to be a “big” player on the international arena, be a counterweight to USA, and to promote peace. And EU hasn’t even worked out which goods will be included in the new embargo! “Previous rounds of U.S. and EU sanctions have done little to stop the bloodshed, although there are signs the Syrian economy is suffering. International measures against Assad’s regime have depleted its foreign currency reserves by half, French Foreign Minister Alain Juppe said last week. EU experts will work out later precisely which goods will be included in the new embargo. One of the diplomats said so-called ”dual-use” goods can include anything from vehicles to fertilizers and other chemicals. The only precedent in international relations for the luxury ban is one imposed by the EU in 2007 on North Korea for its nuclear and ballistic missile programs. Officials said this could serve as a model for the same measure against Syria. That ban included foods such as caviar and truffles, high-quality wines and spirits, fashion accessories including bags and shoes, perfumes, crystal and silverware, and purebred horses. ”The European Union agreed Monday to slap new sanctions on the Syrian regime, banning luxury goods exports and further restricting the sale of items used to repress dissidents, a diplomat said. ”These sanctions will be put in place against Syria,” the diplomat told AFP after EU ambassadors endorsed the measures ahead of a meeting of foreign ministers in Luxembourg. The extent of the luxury ban has yet to be defined but the aim is to deliver a symbolic blow against the posh lifestyle of President Bashar al-Assad and his glamorous British-born wife Asma, another diplomat said. ”The Assad couple, as well as his inner circle and leaders of the regime must be made to understand that events in Syria will also impact their personal lives,” the source added. Brusselsalso decided to expand the blacklist of dual-use goods which can be used for internal repression or for the manufacturing of equipment used for internal repression. So now after the 14th round of sanctions the EU blacklist is totalling 126 people and 41 firms or utilities. Yes, the sanctions have some small effect and it annoys the Assad ruling circle but that’s about it. So what are EU doing about the Russian, Iranian and Chinese massive support and sanction busting? Because then you have to annoy them, and of course you cannot do that. So instead, ALL the efforts of EU is into these quite meaningless sanctions. When EU has imposed the say 48th round of sanctions, maybe will be worth writing a post about it. On one side Russia, Iran and China literally pouring in all types of heavy weapons (remember the 240 mm Russian mortar bomb), personal, training etc for the Assad regime. On the other unarmed civilians and a resistance with some light arms. And NATO is apparently very worried that if the civilians get anything more than Kalashnikovs and the odd RPG, so they at least can defend themselves and offer some resistance to the Assad forces, that that would constitute “a proliferation of weapons in the region”. “NATO’s chief on Monday said the alliance was opposed to providing arms to the Syrian opposition seeking to counter a regime crackdown, warning that it would fuel a proliferation of weapons in the region. ”We monitor the situation closely,” Rasmussen said, adding that the situation in Syria could impact neighboring Turkey, a NATO member. This must be one of the most hypocritical, cynical and ridiculous statements ever made by NATO. The people of Syria will “thank you” for your “deep concern” as they are being slaughtered by the Assads forces. So according to this superb NATO logic, the Russian 240 mm mortar bomb, supplied by the as always helpful Russia, used to destroy block after block, neighbourhood after neighbourhood in CIVILIAN Syrian cities, is NO PROBLEM WHATSOEVER. By the way, the use of such weapons in dense urban environments is a war crime. But giving this to the resistance so they can defend themselves is a serious “proliferation of weapons in the region”. Really good work there NATO! This is the same NATO that without any hesitation went in full scale in Libya. Then it wasn’t any talk about “that it would fuel a proliferation of weapons in the region”. “It is also very interesting to compare how eager the Obama administration, EU and NATO was to go into Libya with their do nothing attitude with Syria. Nor did Gaddafi kill so many Americans as did Assad (Bashar and Hafez al-Assad – It is A Family affair). Etc. Etc. Then there was NO concern “that it would fuel a proliferation of weapons in the region”. 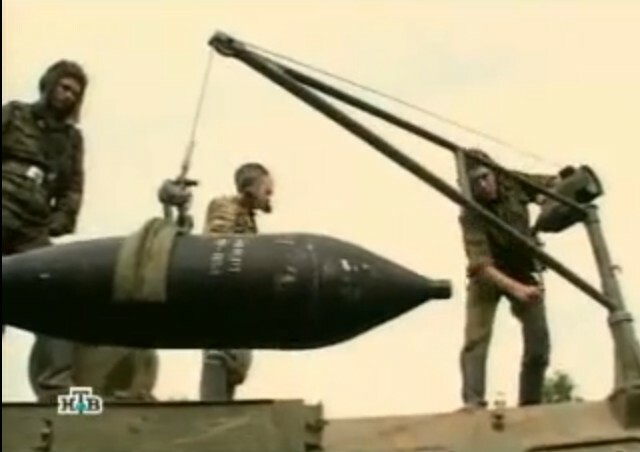 In fact, NATO gave sophisticated weapons to known Al Qaeda groups like LIFG. As I said before, it is so ABSOLUTELY mind-boggling hypocritical that you just want to throw up. And while NATO is “concerned”, the Syrian civilian population continues to get slaughtered. And that Samantha Power, Special Assistant to President Barack Obama and Senior Director of the National Security Council, mentioned above just got apointed by Obama to head the new White House Atrocities Prevention Board. But still on Syria? NOT A PEEP! So apparently she is VERY SELECTIVE in which atrocities to “prevent”.